I've been so inspired by all the amazing pasta dishes on the food blogs this week, so I decided to make my own too. Sometimes the simplest things taste the best. This pasta dish is like that. There's not much to it, but it's so refreshing. warning: this "recipe" is kind of vague, I was just throwing ingredients together... but I don't think the exact quantities even matter for this dish. You'll get the idea. 1. Boil some pasta (I based the recipe on a meal for 2 people). 2. In an oiled ovenproof dish, bake cherry tomatoes at 350 degrees for 20 minutes (average 4-5 tomatoes per person). 3. Steam some asparagus (I used the entire bunch, approx 12 spears) unill just cooked, but still firm. 4. For the "sauce", stir-fry 3 cloves of garlic (chopped) in a generous amount of olive oil (I'm guessing around 3-4 tablespoons), remove from the heat, and add the juice of 1whole lemon. 5. 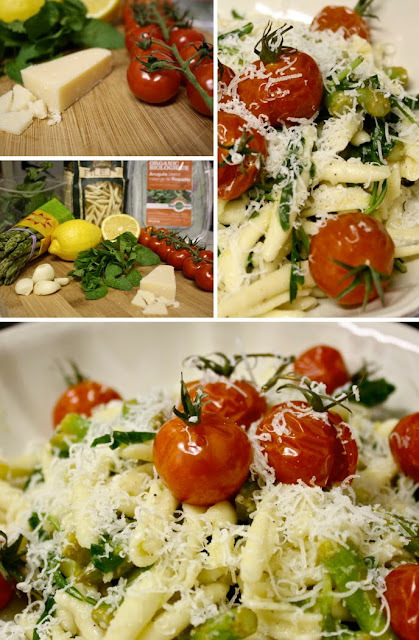 Mix the pasta, cooked asparagus (chopped into bite-size pieces), and some rocket (arugula) leaves into the lemon-garlic mix (approx. 1 large handful of leaves per person). 6. Season with freshly cracked black pepper and sea salt. Divide among bowls and top with roasted tomatoes, and generous amounts of freshly grated parmesan cheese. I'm going to try this tomorrow!